"Kidvid soars into the realm of dazzling computer animated graphics in 'Galloping Minds,' a smart and snazzy series devoted to captivating little viewers -- even as it teaches them a thing or two. 'Alphabets' (volume one) takes children on a delightful tour of their ABCs via live-action footage of zoo animals, old fashioned-cartooning, and clever computerized renditions of all 26 letters. And 'Shapes and Colors' (volume two) brings the beauty of the rainbow to the small screen, as simple crayon renderings blossom into eye-popping pictures that will keep wee ones riveted. Bouncy electronic music and gentle narration add just the right touch to this marvelous new addition to the universe of children's home entertainment." 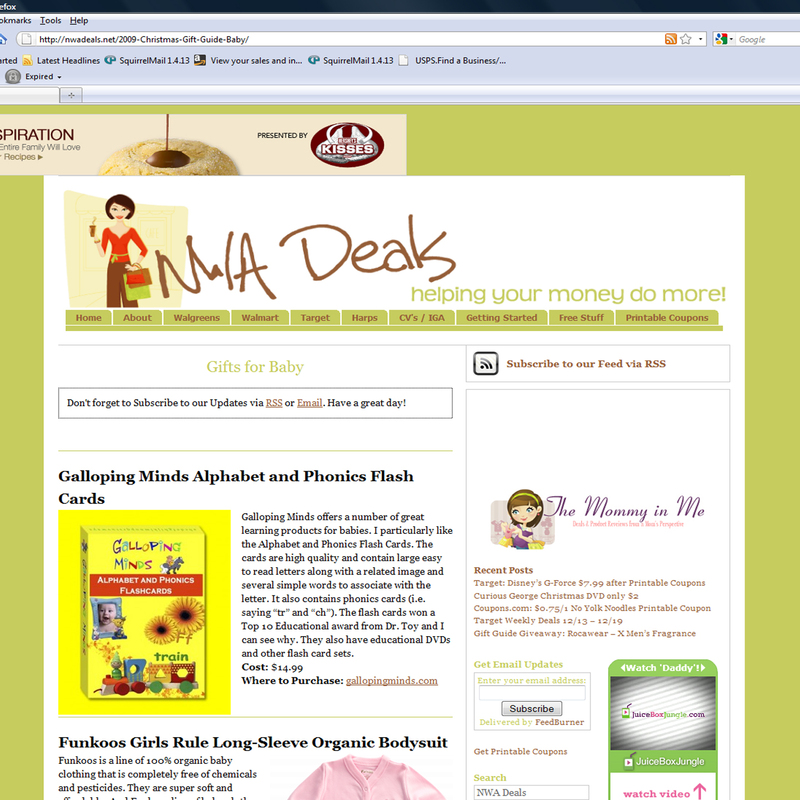 "Little minds will light up with the two newest entries into the infant DVD/video market. 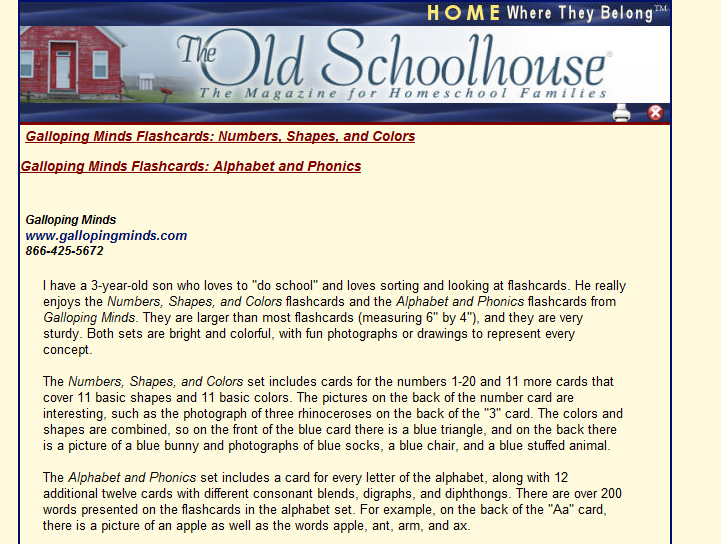 "Alphabets" and "Shapes and Colors" by Galloping Minds." All our DVDs/videos have been awarded the Dove Foundation Approval Seal for good family entertainment. Galloping Minds Alphabets is a 40-minute full color DVD intended for preschool through kindergarten children. Featuring a colorful alphabet video that blends letters with still images - such as the letter "R" with a photograph of a rhino - and light classical music in the background, Galloping Minds Alphabets is a rewarding and educational treasure to share with one's children and show them just how much fun learning can be. Also very highly recommended is the companion DVD Galloping Minds Shapes And Colors ($14.95, 30 minute, Color) which is specifically designed to stimulate the minds of babies and children up to 6 years with ppbeat music and colorful images of two-dimensional and three-dimensional shapes creating an enchanting experience of color, sound, and basic building-block educational fun. Preschool Baby Learns About Computers: Tubby in Computer World is a DVD presented by Galloping Minds for tots 2 to 6 years old. A digitally animated teddy bear hosts this extremely basic tutorial to the fun of pointing-and-clicking on the PC, including age-appropriate introductions to the mouse, keyboard, and monitor as well as internet visits to faraway places such as the Statue of Liberty and an Egyptian tomb. A wonderful DVD to help familiarize and acclimate young people to technology in a modern world where an individual's career and financial success are increasingly dependent on being computer savvy. 30 minutes, color. The first installment in the Galloping Minds series, this video uses unique animation techniques, movement, and color in order to stimulate the brains of babies and toddlers. While appropriate for infants, the program allows for older toddlers to enhance their word/object association and spelling abilities. Over 120 separate objects are displayed and spelled out in both upper and lowercase letters. This series is designed to increase the cognitive, creative, and spatial reasoning abilities of young children. The second installment in the Galloping Minds series, this production uses creative animation techniques and vivid imagery in order to showcase a variety of different shapes. Appropriate for infants and young toddlers, the colors are designed to stimulate a child's visual senses as well as introduce them to both the second and third dimension. Preceded by Galloping Minds, Vol. 1: Alphabets , this DVD is encourages cognitive ability, creativity, spatial perception, and mathematical thinking early in life. Perfect for the budding blogger!"